The Saucha Bhartha (Clean India) campaign is designed to remove the garbage surrounding us – our homes, businesses and public places. But before we can do this we need deeper community discussion around the frame of mind that causes this mess. Otherwise, we will do as we have done in the past – make a grand effort for a few weeks. And then things will revert to the same old mess. We are taking for granted all 5 elements that construct this universe, and guarantee our place in it for a short time. We no longer wonder at common things like seeds and water. We have lost our faith in miracles like the trees and the sun. With our new, smarter brains we can comfortably explain them away with science and reason. But all scientific arguments take us to one crossroad – the beginning. This is why I love the science of Hindu religions, because it includes the spirit beneath what we observe every day. There is so much discussion about global warming and climate change. But our seers and saints had discovered the importance of it hundreds or even thousands of years ago. Lord Krishna, Siddha Jasnath, and the founder of the Bishnoi tradition Jambhoji are examples of this prophetic wisdom. In the Bhagavad Gita Krishna said, “I am the seed of all existence. There is no being, moving or still, that exists without Me.” He meant Me the spirit, the creator and creation itself. Yet here we are in a world full of chemicals, obliterating the health-giving spirit in many things we see and consume daily. In Masaru Emoto’s best seller The Hidden Messages in Water, he proved that water contains a reactive, creative spirit. When shown various images – mountains, a dolphin, a building, etc, it formed ice crystals similar in response to each image. Yet crystals were malformed, or even unable to form in reaction to these images, when chemicals were introduced. We justify adding chemicals to water to keep it safe for consumption, but can we begin to expand our attention to ask How can water sustain us if we have destroyed the spirit within? All processed food is dead – devoid of proper energy to sustain a healthy body. It might fill you up and give you the impression of a satisfied body. But over time your body will be depleted of the energy it requires to avoid disease. All of nature, all of everything contains (The) spirit, until we devise a method of eliminating or repressing it…..thus condemning ourselves one unhealthy year after the next. The self-destruction has occurred over centuries, slowly at first so we didn’t take much notice, but now it is picking up speed. We are nearing the end of some valuable commodities such as nitrogen, and important collaborators for our farms and gardens – the bees. Water and seeds are being altered and privatized. The air in and around Asia’s major cities is unbreathable. But the first step toward recovery is not regulation – better laws will not protect us from ourselves. The primary reason for pollution is lack of spiritual values – connection to nature. So the first step must be Sauche – a cleansing of yourself: body mind and soul. The Bhagavad Gita describes purity at three levels in Book 17, verses 14-16, namely body, speech and thoughts. Purity of body comes from cleanliness of body as well as from what one eats and drinks. Purity of speech comes from being truthful and through use of words that are not injurious, hurtful or distressing to others or self. Purity of thoughts comes from reflection, peace of mind, silence, calmness, gentleness and purity of being. Ritual purity is not easily understood in the West where there is more focus on the material existence. This is a major difference in the West/East traditions. Here, purity of mind, speech and body is one of the most important virtues in Indian philosophy. In the spiritual sciences the mind consciousness is connected to the body and all material manifestation. This connection has been important in all spiritual traditions. In the Hindu traditions we clear our mind and heart, wash our hands and feet before worship, and clean our houses thoroughly before Diwali in order to attract blessings from Laxmi for the new year. 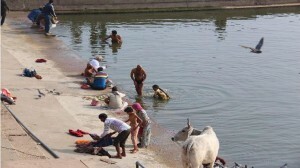 In Islam and Siddh traditions they wash before praying or entering mosque. Jews scrub their homes clean before Passover and have water rituals for Sukkot. Christians perform ritual bathing for Baptisms. Christians say “Cleanliness is next to Godliness.” In the Hindu traditions we say, “Look! This house is a playground of G-d!” which doesn’t mean well-decorated or rich. It means organized and clean. And it isn’t restricted to just your house – it is your yard, your community, your body. If you are not clean you cannot support and enhance your environment. Anger, jealousy, prejudice and fear are the impurities you should seek out to dismiss through a healthy lifestyle and habits. Once you engage in this process, your spirit will gain strength and the ability to recognize the spirit in everything else. Just as the ice crystal in Masaru Emoto’s experiments could recognize and emulate the images presented, you too will begin to reflect back into your environment the eternal throughline that has brought us all here together……even to this environmental challenge we are discussing today…….it has brought us here too. I know everything gets worse before it gets better, and that sometimes a cause needs such a catastrophic event to raise the awareness of the masses. This is unfortunate that we have lost the attention span of our ancient rishis and seers. But we can start today with what we have and move forward, on this path. There are many great initiatives around the world generating much awaited momentum toward a healthier environment. But if you can’t go off the grid just yet, you can start with yourself. I give emphasis to Sauche during initiations. This is a good place for you to begin.